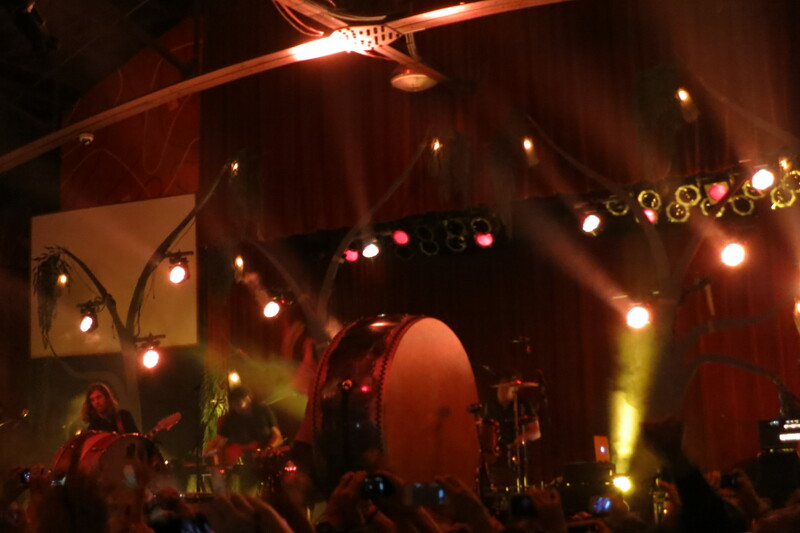 “I’m radioactive:” Imagine Dragons and Asheville, NC | Dorothy Ann Writes! So it started around Tuesday or Wednesday, with some Facebook posts. Now that I think of it, my adventure to Venice started with a Facebook post too. So thanks, friends for planning exciting things, and posting on Facebook. Anyways, my friend Hannah posted saying she was driving to Asheville, North Carolina, to see a band called Imagine Dragons, and was looking for someone to buy an extra ticket since someone had dropped out. At first I was going to err on the side of caution since I’m trying to budget sensibly like an adult… but then I remembered that life is short so adventures ahead! We piled into the car on Friday night and headed to Knoxville, where we stayed with a friend of Hannah’s. The adventure really kicked into gear as we headed east in the morning: turns out February in the Smoky Mountains is no joke. Okay, I’m exaggerating. 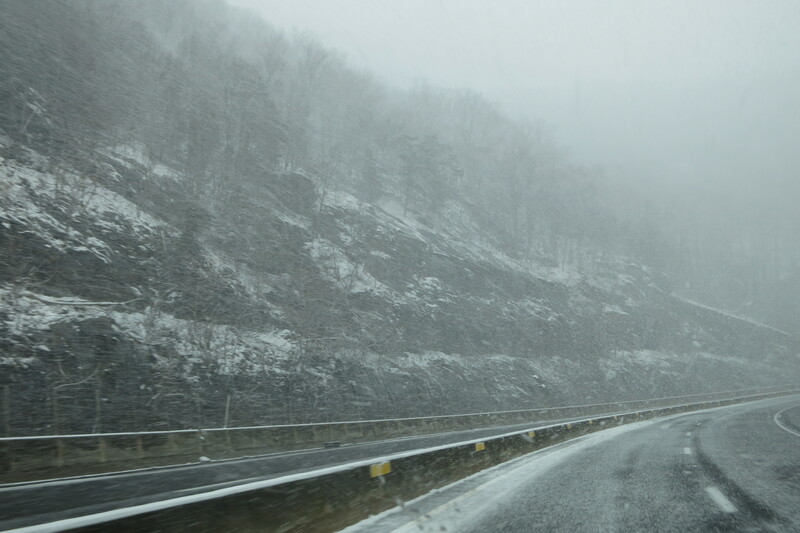 We only drove through the snow for an hour or so, and it wasn’t that bad. One of the few good things about snow in the South is that if people can get inside and avoid driving in it, they will. After a few flakes of snow the traffic noticeably thinned out and we were practically alone on the road. We proceeded with caution and made it to Asheville in the early afternoon, but of course the show wasn’t until 8pm so we had several hours to wander around the freezing, hippie city of Asheville. I guess this is the part where I explain that Asheville has kind of a reputation as the Portland of the South. A friend who went to Warren Wilson, a nearby college with a working farm (actually, that already tells you something about Asheville) says “it’s like this little oasis of northern culture and attitudes in the middle of the south — you go about five feet outside of it and you’re with people that could be just as at home in West Virginia or Georgia but the city itself is just like this little pocket of northerners.” But “northerners” isn’t the world that a lot of people would choose… I think more like “hippies.” The industry is heavily tourism-based, there are a lot of cute hipster cafes and restaurants and as far as I can tell the city works to keep this reputation, drawing a young, liberal crowd from the nearby religious/conservative areas. 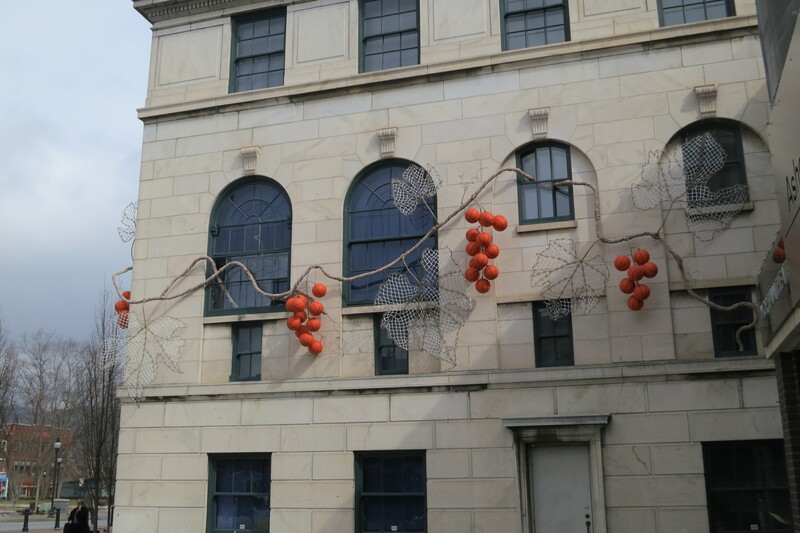 Also, “basketballs don’t grow on trees” sounds like something a gym teacher would say if the kids kept losing them. We had a whole afternoon to check out one hippie store after another (incense! handcrafted gloves from equador! a wall of anti-Romney stickers, now 40% off! a shop of beads including vintage ’40s beads and ones made from garlic skins and tobacco! a used bookstore! more incense! Grateful Dead fabric wall hangings! another used bookstore!) 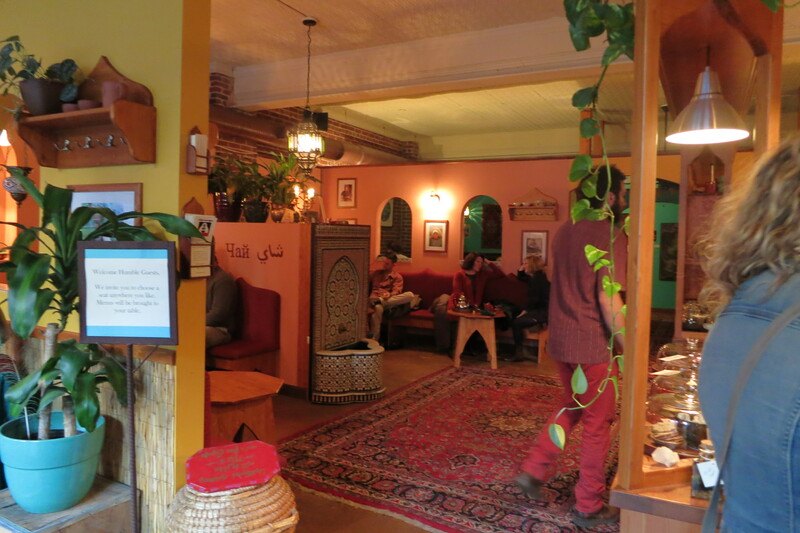 before something caught my eye: yet another tiny adorable cafe, this one called Dobrá Tea. Yeah, Dobra. Like Dobry Den, that thing I said all the time last semester. Dobra/dobry/dobre is Czech for ‘good,’ and turns out there’s a whole chain of Dobrá Caj, or Dobrá Tea, depending on the country. A taste of my home away from home! 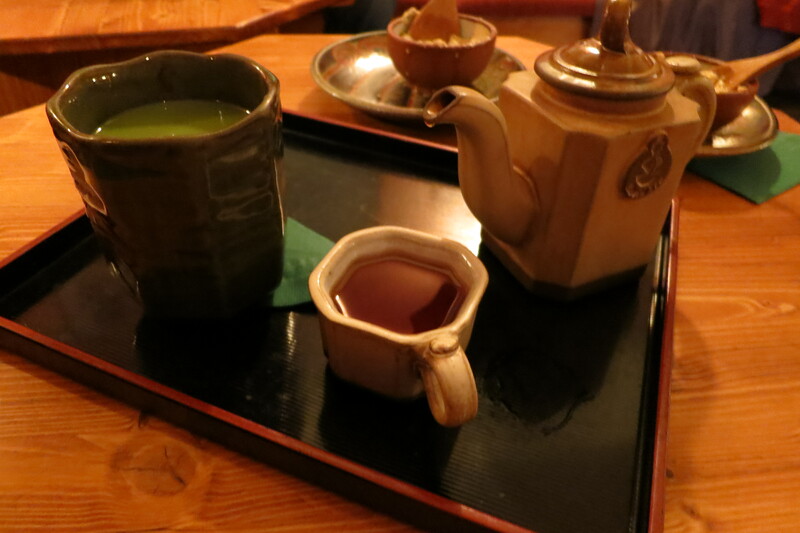 Except I had a Japanese tea and Hannah had a Chinese one. The decor reminded me of a cafe where my friend Rachel and I once did homework on good old Francouzska street. We eventually had dinner and headed to the venue for the show. Everything was better than expected: the sound quality was great, one of the opening bands was stellar, and the band we came to see, Imagine Dragons, didn’t disappoint either. I’m not normally a fan of female singers, but this one (singer for Nico Vega, the opening band) had more stage presence than Roger Daltrey. 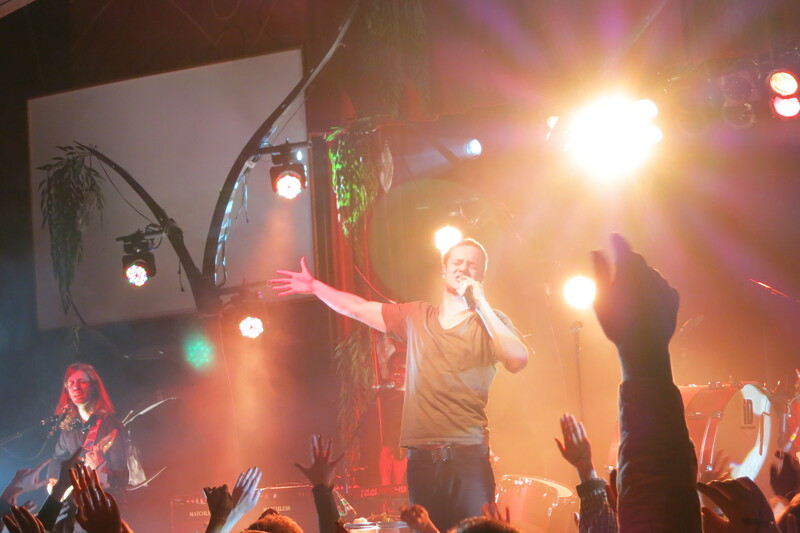 So, Imagine Dragons. They like big drums. I mean, really big drums. You can record anything you want and have really great speakers, but nothing matches the reverberations of a real, physical, 7-foot-tall drum. Also, they had some tree props. I’m not sure what’s up with that. If Passion Pit, MGMT, and the Killers had a child, it would sound like Imagine Dragons. 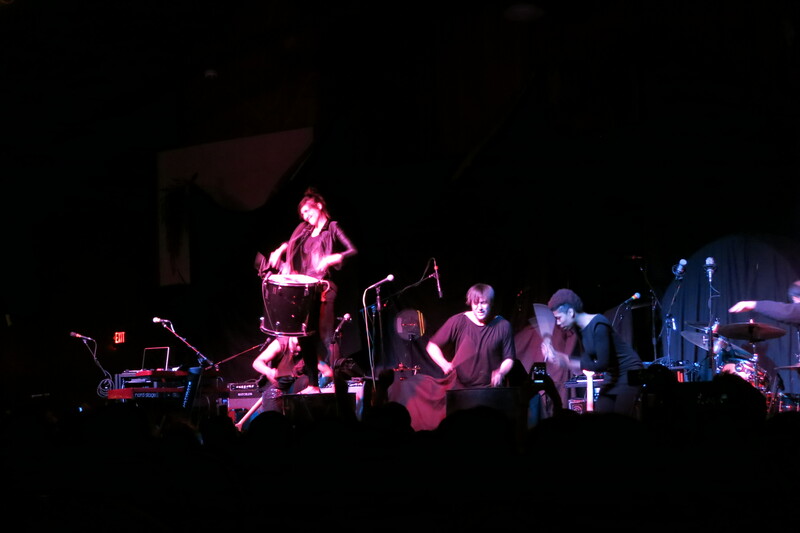 Heartfelt lyrics, post-indie music, just a tiny hint of electronica, and a dash of hippie- definitely a good fit for Asheville’s attitude, and the crowd showed it: the singer said we were the loudest audience on this tour, including venues five times the size of ours. Here’s the song that left the biggest impression. It’s one of their singles but that means the crowd was pumped, with the gigantic drum resonating and everyone singing along… They’re definitely worth checking out. We headed to another of Hannah’s friends’ house for the night and drove home this morning, a pleasant enough 5-hour drive. I definitely wouldn’t want to make the drive by myself, but given a carful of friends and a good reason, Asheville will see me again. Dorothy, I read the blog and I have no idea what you’re talking about. I’m your oldest fan, so forgive me. Next time in Ashville check out the Grove Park Inn and have a cocktail on their sunset porch. Also the Biltmore House is something to be seen pre-Christmas when they decorate the place for the season or in warm weather when the gardens are in full bloom.The Peter Sellers film classic “Being There” was filmed the Biltmore. I think it is the the largest private home ever built in the US. A Vanderbilt railroad magnate kid built it. The gardens and landscaping are designed by Frederick Law Olmstead. He designed Central Park in NYC as well. I definitely want to go back when the weather is nicer. It was way too cold and/or I didn’t wear enough layers to just stroll around, which I think the area deserves. It seems like a walk-around-and-take-pictures place, but I was too worried about frostbite. I’ll add a picture of some art for you though! Re: North Carolina and Hippies as alien beings. Back in the sixties/seventies, Husband Ted and I were enjoying the better part of seven years at UNC-Chapel Hill, up to our ears in the student movements of the time, marching on the administration building, busing to DC, and active in Orange County Young Democrats. All excited, we went to a State Democratic Convention as delegates. Our delegation was integrated, had both men and women, tall and short, young and old. Our town mayor and congressional candidate was a black man, Howard Lee, who had a very brief national career. i.e., at the National Democratic Convention that year, in the spot that Howard Lee was featured as a speaker, television coverage cut back to Walter Cronkite at CBS News after Howard’s first three words at the podium. Oh well. Anyway, this is about what kind of alien a Hippie must be. You were saying Northerner. 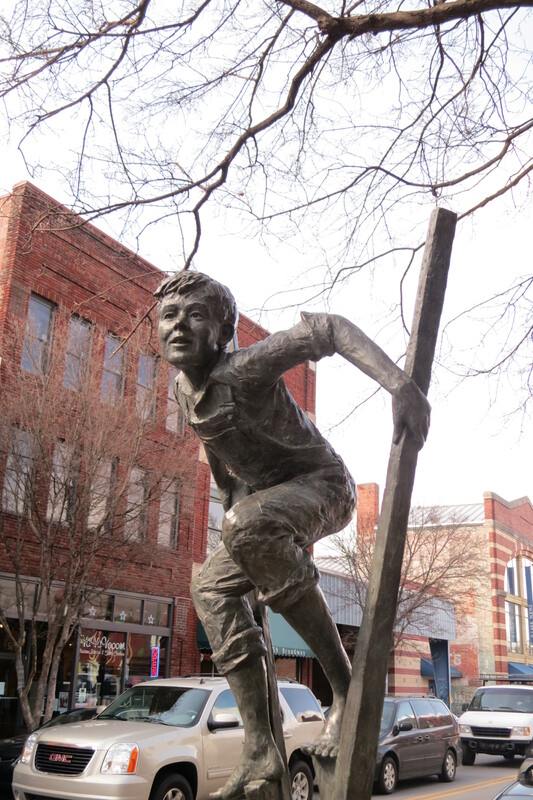 In Raleigh that year, overheard in the crowded lobby, “…did you see those people from Chapel Hill? They got more Hippies than WHITE men on that delegation–I swear.” So do I.
Haha oh my gosh, that is an awesome story. ← “Reverse” Culture Shock: Back to Nashville! I will never forget, I will never regret, I will live my life. One of my first profound religious/spiritual experiences. Japan 2011. Visit to Auschwitz/ Holocaust Second Generation Witness This was one of my hardest posts to write, but I believe it is very important. Auschwitz 2012. A Shoe Story A blog post that makes me tear up. It’s about a pair of shoes.